Will you soon be obtaining your bachelor’s or master’s degree? If so, you should have a look at the interesting possibilities ALTEN is able to offer you. You will need an engaging and challenging project if wish to graduate, but you will also need the right supervision and experienced colleagues on whom you can rely. That is what ALTEN can offer you. Choose from the various final projects that are listed on our website or send us your idea for a final project. This may also be a certain area of interest. We would be pleased to discuss this with you and attempt to find a suitable subject in mutual consultation. If you would like to qualify for performing your final project at ALTEN, we would like to receive your CV and a motivation letter in which you indicate which project or area of interest appeals to you and why. If we think there are sufficient possibilities for you we will invite you to a meeting to become further acquainted. Read the stories of graduates at the bottom of this page to gain an impression of the projects they have realised. If you start work at ALTEN as a graduating student, you will receive an internship contract and of course decent internship pay. You can participate in all activities that are organised at ALTEN (informal outings, knowledge evenings, monthly meetings and more) and you will be supervised by an experienced consultant. This consultant will be in contact with you every week concerning your progress, give you tips and support you in resolving problems. You will also be supervised towards submission of your thesis. 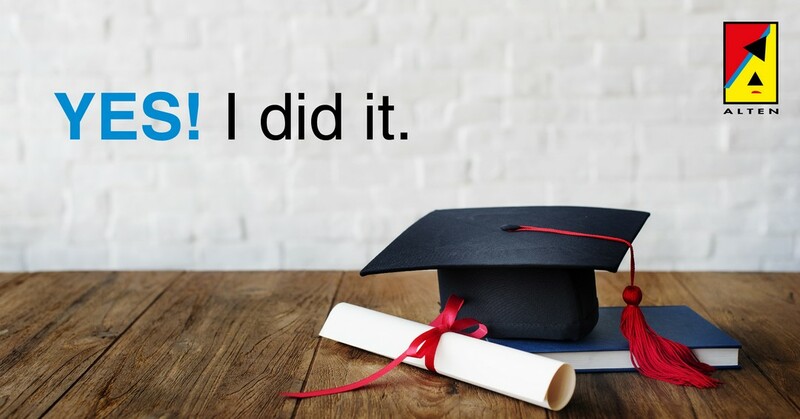 And … did you graduate? You may also qualify for a position at ALTEN! Have we made you enthusiastic about graduating at ALTEN? If so, check our internship vacancies and apply!